John-Joe O’Toole is fit and available to play for the Cobblers in their Sky Bet League Two trip to Tranmere Rovers on Tuesday night. 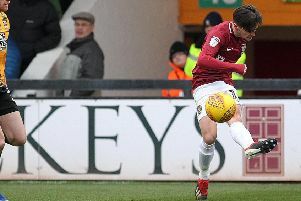 There were concerns the midfielder would be ruled out after he left the field having taken a knock during Saturday’s 4-0 defeat at the hands of Colchester United, but he is okay. Fellow midfielder Sam Foley’s back injury is also ‘improving’, but it seems the trip to Prenton Park will come too soon for the former Port Vale man. Asked on Monday lunchtime about inujries in the squad, Curle said: “The squad is not bad, and John-Joe has reported back fit for training today. Definitely out of the trip to the north west is left-back George Cox, who is facing a few further weeks on the sidelines with the ankle ligament injury he suffered at Cambridge United last month.